A few weeks ago I went to a friend’s bridal shower where we all pitched in to provide a handsome spread of food and drink. I was on wine and smoothie duty and my friend Lisa made the hummus. I’ll be honest: I was expecting was another standard hummus that was good but didn’t taste as good as restaurant-style. What I wasn’t expecting was to eat some of the best hummus of my life. For reals. Ready for this recipe? I’m SO excited to share it with you! A few bites in when my mind finally wrapped around what my mouth was tasting, I turned to Lisa and asked how she made it. She explained it was a recipe from her brother- and sister-in-law who were both amazing cooks and caterers on the side. The concept is to cook the garlic cloves in with the chickpeas (liquid and all) so it gets SUPER creamy and takes on a extra garlicky flavor. It also seems to meld all of the flavors together a bit more to give it an ultra luxurious finish. Microwave before and after. See the difference? It may seem subtle, but the flavor/texture pay off is MAJOR. The other kicker? 1/2 cup tahini. HALF CUP. Just trust me. Best hummus ever. Once your chickpeas and garlic are microwaved, add straight to a food processor or blender with your tahini, lemon juice, sea salt and a bit of olive oil. 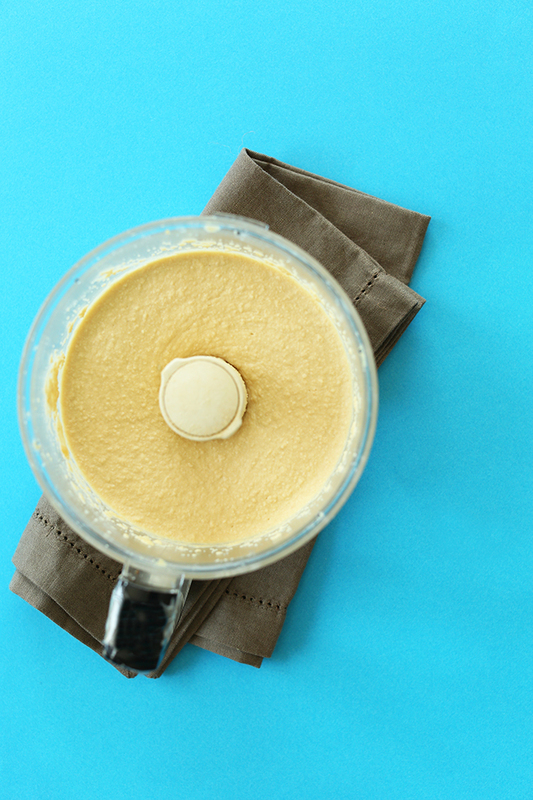 Then whirl until creamy and smooth and prepare yourself for the most insanely delicious hummus of yo life. 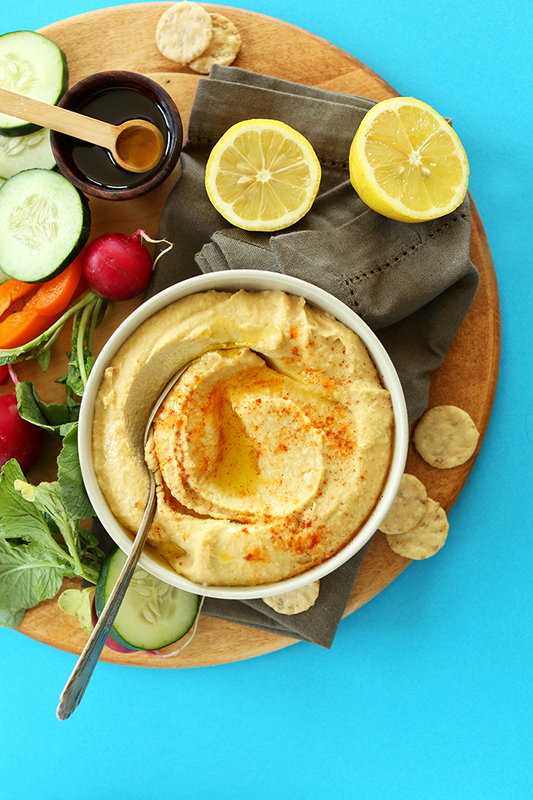 Though this hummus comes together in 5 minutes, it’s going to be hot! So, I recommend making it ahead of time and refrigerating it so it gets even more thick and the flavors can meld together. I don’t know how a refrigerator can make this dip taste 13x better, but it just does. Trust me. Serve with pita bread and/or chips, veggies, or just a spoon. Seriously, I would just eat this with a spoon. Make this now! 6-ingredient hummus that comes together in 5 minutes and magically transformed into the best hummus thanks to the MICROWAVE! Trust me. It’s the best hummus I’ve ever made at home! Microwave undrained chickpeas and whole garlic cloves in a mixing bowl for 4-5 minutes. Add to blender or food processor and process with lemon juice, salt and tahini. Stream in olive oil while mixing. Process until smooth and creamy, scraping down sides as needed. Taste and adjust seasonings as you prefer. I found 3/4 tsp of salt to be the perfect amount (amount as original recipe is written // refer to the lower end of range if altering batch size). Garnish with a little more olive oil and paprika, and serve with veggies, crackers and pita. Leftovers keep in the refrigerator for up to 1 week or more. It tastes even better refrigerated, as it has time to thicken up and develop in flavor. *Recipe created by Rebekah and Justin Hubbard, and shared by my lovely friend, Lisa. After some aggravating internal issues (hardened/separated tahini, an uncooperative blender), I just got to taste this recipe — it is FABULOUS! I do have a very good recipe from an Iranian friend of mine, but this one needs much less advance thinking. Thanks! It is a keeper. I’ve been using the same family recipe for hummus my whole life, but decided to give this a try and I am SO GLAD I did! It is perfect. The only adjustment I make is easy on the tahini (because it’s not my favorite) and I add 1 tsp cumin per can of chickpeas. I often double the recipe and then use some of this hummus to make a double batch of Dana’s 5-Minute Vegan Caesar Dressing because it is also THE BEST! I make both nearly every week and pretty much live off of veggies and hummus and kale Caesar salads. Thank you for these incredible recipes!!! Made this for the second time today. Perfect right out of the blender. So easy and fast. Made a vegan hummus quesadilla right away. It was divine. Thanks for another delicious recipe. I’m so pleased with this! I made this and it is awesome. I added more lemon juice just as my taste preference but it was so smooth and delicious. Very quick and easy too. Thanks for sharing. I love this recipe!! I added a roasted red pepper to mine and it’s amazing! Quick question about your nutrition info, what was the serving size for the caloric info provided? Was it based on a 2 tablespoon serving, 1/4 cup, something else? Just curious for my own nutrition purposes. Thanks!! Came out so creamy – like butter! My wife said she could just drink it as it was. I thought the tahini was a half of a tad overpowering so next time I’ll reduce it down to 1/3 cup instead of 1/2. Other than that it was the best hummus we’ve ever had! OMG!! I am officially NEVER buying store hummus again! PS I added a little liquid smoke and PREPARE to thank me when you try it LOL, its even more amazing! The best hummus I have ever had! Both my girls gave it a ?. I’ve made this recipe so many times and think it’s fantastic for such a quick and easy recipe. Sometimes I add roasted red peppers :) otherwise just as written! Whoop! We’re glad you enjoy it, Mary! This is a favorite, especially with the four cloves of garlic! I cook my beans from dried, put them up hot in their cooking liquid in quart canning jars, & keep them in the fridge. Used 1/2 the jar. No microwave, so simmered beans with 5 large cloves of garlic in a saucepan. No lemons in the house & didn’t want to use the plastic squeeze bottle of “juice”, so used fresh-squeezed grapefruit juice. I had to run the food processor a long time to get it smooth, but I blame my over-rated, incompetent Ninja for that. It was bland. I missed the zing of fresh garlic & it really needed cumin. I added 1 small clove of raw garlic & a sprinkle of ground cumin – maybe a 1/4 tsp. MUCH BETTER! Next time I’ll toast cumin seeds instead. Added a bit more salt & olive oil. Still very thick & a bit dry. Needs a bit more juice than 2tbsp. The grapefruit juice was surprisingly ok! Didn’t throw off the flavor. I really appreciate the science behind heating the beans – totally makes sense! Thanks for the recipe. Hubby will be happy. Thanks for sharing your changes, Tia! I have been making this every week for several weeks now. I L.O.V.E. this recipe. Easy, creamy, and you are right…tastes better as it sits. I have made it as is (excellent), but also have experimented with different flavors…primarily some chipotle and once with green chile. Next week, maybe use some sesame oil with sriracha. Thanks for the great recipe. Awesome. Easy. Better than store bought. Thanks!! I have loved everything I have tried on this site, and have the cookbook, too. 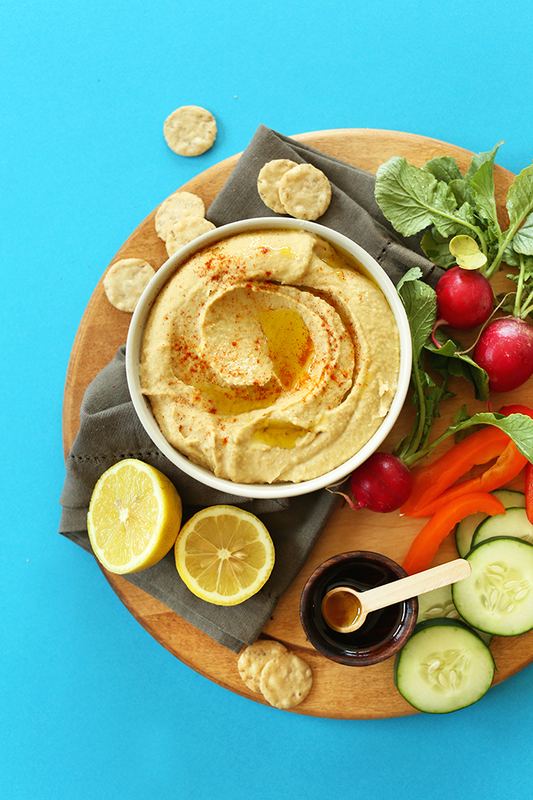 But this hummus is out of this world and so easy. My hummus is always hit or miss, so I wasn’t expecting much, thinking that if the hummus gods wanted to bless me today, they would. It was SO GOOD! I made it to take to the beach tomorrow, but may have to make another batch as there may not be much left! 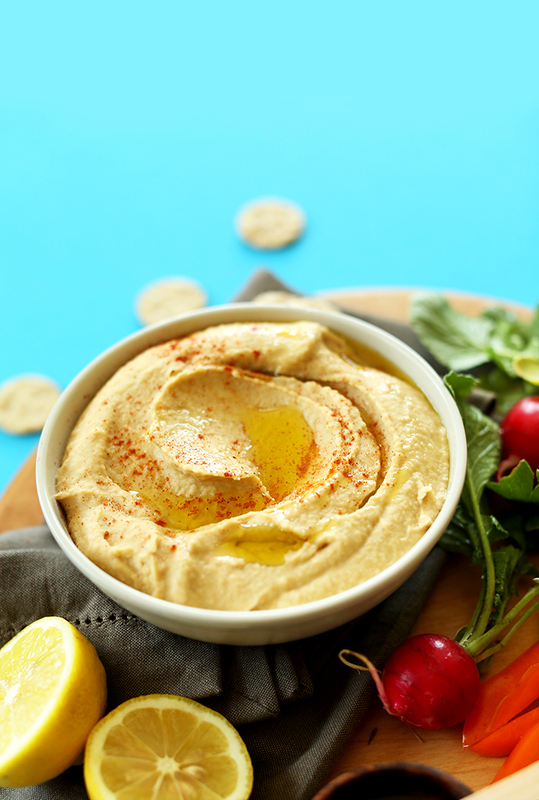 Made this today… this is seriously the best hummus ever! Thank you so much for sharing. After reading through this I remembered a Mediterranean friend of mine who swore by using canned chickpeas with the juice as the key to the best hummus ever! I bet she made something similar to this recipe. I am going to try it and see. She also topped hers with olive oil and paprika, like you suggest. Your recipes are so exciting and fun to make!! When we microwave the chickpeas and the garlic for 4-5 minutes, Should the microwave be at maximum?? No, just the standard setting! This is delicious! I’ve been a huge hummus fan for years, but, embarrassingly enough, I only learned that you’re supposed to put tahin into it two weeks ago (which explains why my past attempts never made me happy…). Tried this recipe last weekend and will keep making it forever (used a pot on a stove instead of the microwave)! Thank you so much!! More than a year later, I still love this recipe & it has truly become a staple here. Great for efficient/lazy people like me: It freezes really well! So I like to make a double batch & put most of it into the freezer in portion-sized containers (simply thawing it in the fridge the night before/morning I need it). HIGH PRAISE!! I’ve been trying various hummus recipes for past couple years. This one is best!! So easy to make!! I used just 1 T EVOO & for me it works! I use refrigerated minced garlic in a jar (Costco) which is easy: 1T = 1 Clove; I used 2.5 T. Thank You so much for this super recipe! Made this tonight. Great recipe!! So so smooth. I have no idea why the first time i made this i didnt microwave the chickpeas and garlic and just blended them with everything, so of course it came out chunky. 2nd time i followed the directions like a smart person would and it came out so perfect and smooth! Also after blending i added a pack of Love Beets honey ginger precooked beets and it made beautiful and slighlty sweet beet hummus!! cant wait to mess around with other add ins! This is my absolute favorite ‘go to’ recipe. Easy as can be, very tasty and a hit every time I make it (which is often)! I recommend a few hours in the refrigerator to really allow the flavors to blend nicely. It’s delicious! I made it exactly per the recipe and it was indeed outstanding. Thank you. I love all of your recipes! I can’t figure out where I went wrong on this one though. I was so excited :( I followed the recipe exactly. It tastes sooo bitter. Like exactly like the tahini. The chickpea water boiled over in the microwave. Maybe I should have cooked them for less time. I’ve never put anything in there for that long. Any suggestions? Best hummus, always turns out with the best consistency. I add cumin and top with smoked paprika, could eat it all in one sitting! This is my go-to hummus recipe. I’ve made it countless times and it’s always so good. This is so easy to make and so creamy and delicious. It has more sesame flavor than any store-bought hummus I’ve ever tasted. I added an extra Tbs. of lemon to make it a little more tart, but the original recipe was just as yummy. VERY GOOD! a little too tahini-y for my liking. I think next time I’ll cut it down to a 1/3 of a cup. otherwise, if you’re into super creamy hummus, def give this a shot. This has to be one of the tastiest things ever….. I CANNOT THANK YOU ENOUGH!!! I just made this and I’m eating it by the spoonful. I’ve tried several other recipes for hummus and I think, obviously you people have never been to the middle east (twice now several countries…go Navy) or have eaten at any kind of middle eastern inspired restaurant. You, however, have changed my world. This tastes exactly like the hummus you’d find in Dubai or Bahrain. I’ve been looking for this recipe for years. Thank you so much. Thank you so much for sharing!! ABFB! Best hummus I’ve ever had!! I’m sorry to give negative feedback, but I found this really bland. I have been making your previous recipe for a couple years and loved it, but this had no flavour, I couldn’t taste the lemon, the garlic, the tahini… maybe because it had too much liquid. I’ll go back to the old recipe in future. I noticed that when I cooked the garlic in the microwave, I couldnt taste the garlic much so I stopped that and mince the garlic in the food processor while the chickpeas are in the microwave. Made a huge difference and I share this recipe with many and give them that tip, always! Plus, I don’t think it needs the olive oil. I make this weekly and have since you posted it! That’s a lot of batches! Thanks, Dana! It was definitely creami-er, but came out way too watery! Had to add an extra can of chickpeas without liquid to make up for it. Hummus all day errday now. So delicious and so simple!! Absolutely LOVED this! Thank you! Question: what would be the proper amount of chickpeas soaked overnight and water if I were to substitute dry chickpeas for the 15oz can? I live in India and dry beans are much more prevalent here than canned and I want to make sure I don’t throw off any ratios! Half a cup of dry chickpeas, soaked overnigh, then cooked. Put all the cooked chickpeas in a large measuring cup and then top up with enough cooking liquid to make 15.5 fluid ounces. Use this instead of the canned chickpeas and proceed with the recipe. This recipe is seriously soo good! It is a little runnier than you would think at first, but it does thicken up as she said. I actually liked mine a little thinner, and used it as a salad dressing last week and it was AMAZING!!! This was amazing. Even hot. I used a hand blender because I had amino food processor. I accidentally spoiled some hot Hummus on me by doing that but tried it and was blown away! No more buying Hummus! I feel like the best quick Hummus chef! Thank you! Also I cut down the tahini to 3 Tbs because I didn’t have that much on hand, but still awesome! Oh wow. You saved my life, Dana. I couldn’t figure out the secret to amazing hummus at home, it always ended up thick and somehow a bit tasteless, I guess because of the added water, even though I always loaded it up with spices, tahini and olive oil. But now – it’s perfect! I can stop buying insanely fatty supermarket hummus with strange additives. Hooray ! I love this hummus so much!!! I wanted to share that I added some of Trader Joe’s Everything Bagel Seasoning, have you tried it!?!? 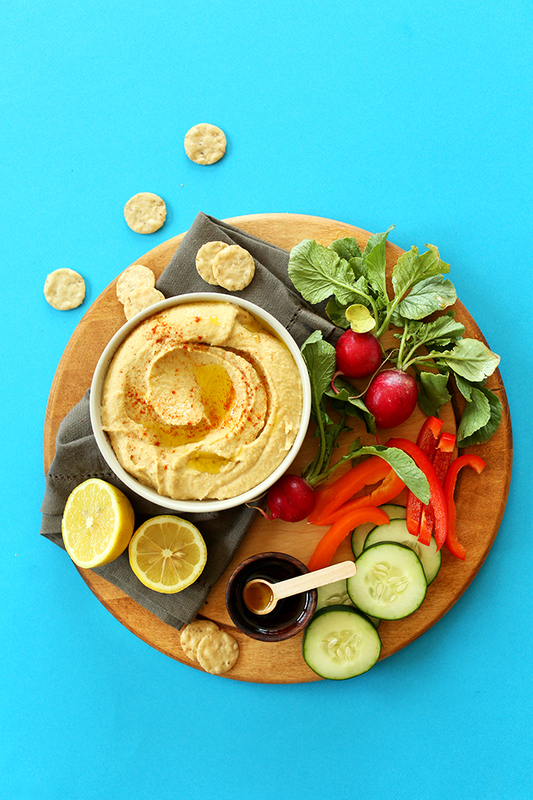 It’s delish and it was really yum in this hummus recipe! Thank you so much for all of your wonderful recipes! I have made many of your recipes and have loved each one very much! You are amazing!! Thanks for the suggestion Emily! That sounds delicious! I jumped over here from your 2017 Breakfast Salad recipe and this Hummus recipe looks amazing and easy. Can you tell me what the small cup of brown liquid is you’ve shown for serving, with the veggies and chips? I didn’t see it in your serving notes. Thanks. btw, I love CSA, too, and must get back to my pickups again. Hi Vicki! I believe that is olive oil but the wooden bowl it is in gives it the appearance that it is brown. Amazing!! I used Meyer lemon evoo and it added a lovely enhanced lemony flavor. This is my new favorite hummus recipe! I’ve made the hummus a few times and it is always a winner, but this time I used black beans instead of chickpeas just to up my dip game. Added some smoked paprika and cumin while blending – delish! Pressure cooker would do the same thing without any radiation. Seems a little oxymoronic to be vegan and use a microwave. I prefer cooking chickpea by myself instead of buying it in store. I had already drained it before I came across this recipe, so what I did instead was that I mixed some starch in water and poured it over chickpea, then added garlic and microwaved it. Totally worked! I also added a little ginger, and it pairs so well with garlic! I have never been so impressed with my hummus as I am today. I can’t even wait for it to cool down, it’s already delicious. Exactly how much cooked chickpeas, water, and starch did you use to substitute for the 15oz can? I’ve already made this hummus 3x this week but want to switch to uncanned peas. Thanks! It would never occur to me to put ginger in hummus, but now I’m curious! Yesterday I made this with grapefruit juice instead of lemon & it turned out well. You’ve inspired me to try it with ginger & orange juice! I’ve made this three times now, once following the recipe exactly, once throwing in some toasted cumin seeds, and once adding a roasted red pepper. It’s so dang tasty. I refuse to make hummus any other way now. I made this hummus recipe this past weekend for an Easter potluck. It was my first attempt at homemade hummus. So delicious! BTW, for anyone reading, we tend to buy the pre-minced garlic in the jar rather than using fresh garlic because we’re kind of lazy about our fresh produce. The recipe worked perfectly fine with it. Seriously this is almost too good to be true. I made this last year with a mediocre blender and was not overwhelmed by the result. I kinda forgot about the recipe until now. The second try with a average Blender (from kmart even) was definitely a winner its creamy and easily customable. ?? Thanks again for another amazin recipe. I’ve made a lot of hummus and this is by far the best ever! Smooth, creamy & delicious! So glad I saw your recipe before making more hummus. We had finished off a previous batch I made that tasted good, but was so thick and grainy. I doubled this recipe, removed the skins, used 1 1/2 cans liquid, and 3/4 cup of tahini, and some cayenne and cumin. It was so good, even warm, and texture was smooth and silky. Definitely kicked my old recipe to the curb. Hi Crystal! It will keep in the refrigerator for up to 1 week or more and tastes even better refrigerated, as it has time to thicken up and develop in flavor, so you should be good to go if you’re making it in advance! I made this and added a roasted red pepper, a teaspoon of smoked paprika, and a teaspoon of ground cumin. Fantastic! We don’t own a microwave so I’m cooking the chix on low stove top.. will it change the recipe? Hi Jasmyn! That will work! My husband loves this hummus so much that I make it every week! I love having it on hand to make dressing for buffalo chickpea wraps (another favourite!) and salads. It’s so easy, inexpensive, and tastes waaaaaaaaaaay better than store bought! Thank you Dana! I never leaves comments or questions, but i had such high hopes for this hummus that i want to figure out what i did wrong. The texture came out perfect. Smooth and creamy. But the taste… it had a weird metalish taste. It’s hard to describe. But needless to say we couldn’t eat it… and my family lovessssss hummus! Could it have been the brand of chickpeas i used? Or the tahini brand? Any suggestions on what could have caused that? I once bought ground cumin that had a bizarre metallic taste & made my whole pot of chili inedible. Or it could be the beans absorbed the metallic taste from the can. Just cook your own garbanzo beans from dried. Soak them overnight, drain & rinse in the morning, & let them simmer. So easy, so much healthier, & far less expensive! Just made this hummus today for Super Bowl snacks. I have to agree with the majority of the comments. This is the best hummus that I have made and I don’t think I’ll buy store-bought hummus any more. Also made the classic falafels to go with. Thanks for the recipe. This hummus is blowing my mind. My search is over. Thank you! Sending love to you and your dear friend who shared the secret. Bravo! This is the first recipe I used from your site, and let me tell you, you have a fan for life! I thought I had perfected a recipe for hummus but this put mine to shame! I didn’t add the olive oil and it was still divine. Thanks! Genius! I just made this and it really is a step up from my usual humous. I might try modifying it with just a pinch of cumin some time, just for fun. Thanks so much for this and all your other inspiring recipes. I haven’t found a bad one yet! Fantastic as is although I did add cumin and green onions. Very smooth. Use organic beans of course. This was great! I put the beans and garlic in the oven at 400 for around 15-20 minutes instead of microwaving them. The garlic taste was much more deeply infused in the hummus than when I have simply minced garlic up and thrown it into the food processor. I NEVER comment on blogs, but this one gave me no choice. I have done the recipe just exactly as she says, and it was magnificent – sincerely the best hummus that I have ever made (and as a vegetarian for 30 years, trust me, I have made a LOT of hummus). This is beautifully smooth and silky, and I can imagine that even when made with only olive oil (as sometimes is the status of my pantry here), it will still be fantastic. Thank you, thank you, and thank you again for this recipe – I will be using it for a while, and looking forward to trying more of your recipes. Great hummus recipe. I make homemade hummus often, and decided to use this recipe for the chick pea schawarma dip also on this site. The hummus was outstanding- this is a keeper. Update: I double the recipe but only use the liquid from one of the cans- I prefer less liquid so that the hummus isn’t runny (personal preference). Even so, when you are done blending it will be thin- don’t panic, it thickens as it stands. I use the full amount of garlic, add a little extra lemon juice and a dash of Frank’s hot sauce. I suggest using a BLENDER. I used my food processor the first time I made it but there is a lot of liquid from the chick peas that seeped out all over my counter. Still turned out fine, but made a mess. This time I used a blender and it worked like a charm. same happened here, Jennifer. Tried it with the food processor and it turned out a bit runny. However, the taste was exquisite. Will try your suggestion next time! Used the microwave and actually prefer the non microwaved version, hummus has been a big part of my whole food plant based diet, so I don’t add oil or salt, but do usually add ground cumin. Once you eat a very clean no SOS (salt oil or sugar) diet for awhile dishes with lots of added tahini and salt and oil are too rich, and hummus with kumin, and garlic have great natural flavors you can enjoy with any added sodium or oil. I made this by simmering the chickpeas + liquid + 3 cloves of garlic on the stove for 4-5 minutes to avoid using the microwave and it was okay. I still ate it all, it was good, I prefer homemade over store bought any day, but I wasn’t wowed. So then I tried it again using the microwave and bumped it up to 4-5 cloves and a little more salt, and WOW. I don’t think I can ever not have this hummus on hand for snacking. I will be making this over and over again. Tell your friends I am forever in their debt. This is the best hummus I’ve ever had! Hummus usually tastes too raw. This is really mellow and so easy to make. I served it at a dinner party and it was a huge hit. Thank you! WOW!! I’ve never tried to make my own hummus before so my expectations weren’t too high, but this hummus is seriously AMAZING!! I’m adding lots of paprika and caramelized onion to mine. YUM. Love that it totally saves money, too! I don’t have a microwave oven but I have a toaster. :D Can I use that to heat the chickpeas? I really want to try this out. We haven’t tried it but I think it could work! Perhaps cover them so they don’t dry out? I voted for your blog on the Disqus poll. You totally deserve to win that; fingers crossed! Requested for school lunches again this week is a win in my book. Mixed it up slightly by dialing back the tahini a bit and adding a roasted red pepper, delicious warm, can’t wait to try it chilled. Excellent recipe!!! Thank you for sharing. I love to make your recipes. Every week I make at least one meal of your blog. The food always turns out well and super delicious, and I simply adore your take on vegetables! I am obsessed with this hummus!!!! I have kind of become a hummus snob since living in Portland and getting the Kings Harvest hummus all of the time (have you tried it yet?!?!) it’s truly amazing but I love that I can save some money and make hummus at home now. Ridiculously easy I can make it when my husband and I have the drunk munchies. It is a close contender to Kings Harvest!!!!! Hi – Love your site. It is my understanding that microwaves denature food by it’s action on the food. Maybe you can explore this topic more and see what you think. Thank you for the lovely recipes! Thanks Paula! I don’t use microwaves much anymore. You can easily warm this up on the stovetop! I can’t wait to make this but I was wondering how this is made if I cook my own chickpeas?! It clearly states not drained, so I am just not sure how to get the same effect with freshly boiled chickpeas. Thanks!! The best and easiest hummus recipe!!!! Thank you so much for sharing. This is the best recipe for hummus so far. It’s simple, quick and easy. I’v tried those recipes where they tell you to mix certain ingredients first (i.e. Tahini with garlic and lemon juice) before adding in the chickpeas to get a better flavor. However, this recipe just throws it all together and it turns out 10xs tastier! I even forgot to add the lemon juice and it tasted amazing. When I realized I left out the lemon juice I just poured it in and whipped it up and it was still super yumny. Also, I didn’t add any oil because it didn’t need it. It was creamy without the oil. And I didn’t have to process the chickpeas for long since the microwave softened their texture. Thank you so much for sharing the best hummus recipe ever! This is THE Best hummus recipe! I just made it for the first time and it’s so easy and delicious! I don’t think I’ll be buying hummus again. Thanks for the recipe! very good! i didn’t really like the texture mine had after refrigerating though..
i was wondering.. how do you calculate the nutrition info on your recipes? thanks! I didn’t have any tahini, so instead I processed some raw almonds, sesame seeds, water and lemon juice. It worked out amazing! I have fresh chickpeas (not cooked, so maybe they are raw?). What do I do instead of the can & water they come in? I just made the 5 minute hummus.. WOW! It is really the best ever. I do not own a microwave so I just cooked beans and garlic on the stove for 5 minutes. Threw everything in the vita mix and blended. I did not add olive oil because I do not use oils. It turned out just fine. Thank you so very much for sharing. I don’t like microwaves so I’m glad you did this via an alternate route and it worked out well…and I also don’t use oil, so another thanks Carol! I LOVE chickpeas and hummus, but I discovered recently I have a sensitivity to sesame seeds, which tahini is made of.. Would anyone know any substitutes to still enjoy hummus ? I make it without the tahini and it is very good! It comes up slightly coarser. Try it and I am sure you’ll be very pleased with the results! ? I’ve heard natural, no-sugar added peanut butter can make a decent substitute. just followed your recipe to the letter and its very wet………………. ?any ideas? had to ad another can of chickpeas to thicken it :( taste great but what did i do wrong? Hmm, perhaps your chickpeas had more liquid than others? It will firm up in the fridge, too. I love this recipe. Thanks for sharing. I have been making this recipe for 6 months almost religiously. By far the best hummus I’ve ever had, homemade or bought. Why buy it when you can make it just as she says, super easy. I’ve made it too many times to count. every 2 weeks for 6 months. I use or try no other. Thanks again for sharing this with us. I just made my 2nd batch this week. This is the best homemade hummus ever. Thank you! Well damn, I just made this and while I don’t have much experience with hummus, this tastes definitely better than the one from the store. Damn I just wanna eat it all now. I made this tonight and – OMG – homemade hummus has never ever tasted better! I actually started with dried chickpeas and soaked/cooked them myself. Once the chickpeas were done cooking, I measured out 2 cups of chickpea/cooking water (mostly chickpeas, but I didn’t drain any of the water) and still microwaved the chickpeas with the garlic. I prefer cooking my chickpeas at home as long as I have time because I can cook them exactly how I want them. I followed the rest of the recipe as written. So so delicious! I’ll be taking this one to parties for sure! Did you ever try making a hummus in which you replace the olive oil by plain water that you kept in the freezer? Don’t freeze it completely but real cold is what you’re looking for. Of course the other ingredients need to be cool too, fridge teperature will do. You don’t need to change anything else and of course you drizzle your hummus with some nice olive oil. Keeps calories down and you won’t believe the creamy hummus you get. Random question, how long will this last if i don’t use the whole lot in one go? Dana answers the leftovers question in the Recipe FAQ! Mine lasts 2 weeks. I divide into 2 portions. I make this religiously every 2 weeks like clockwork. Delicious! I attempted to make hummus several years ago and it was terrible, but this recipe is perfect! Thanks for sharing! Made this a few days ago and it’s already gone! Seriously soooo much better than store bought both in terms of texture and taste. My kids and their friends love it too. Great with siracha mixed it :) Will be adding roasted red pepper to the next batch which I will surely be making in the next day or two. Thanks for sharing this recipe. It’s definitely a keeper! Oops somehow missed a star but I give this a 5 star/2 thumbs up! Yay! thanks for sharing Heather! So glad you liked it! When this first came out of the food processor it was SO liquidy I thought I’d done something wrong! It did firm up in the fridge but it’s still a little more watery than I’m used to. I do think it’s tasty, but I think houmous is entirely a matter of preference and for me this was a bit too heavy on the tahini. I’ll definitely use the technique again, but maybe with a little less water, less tahini and more lemon juice. Great idea though – the smoothness is great! This is a good work-night recipe. As a hummus obsessive person, though…I am sorry to say…it tasted liked canned beans. The consistency was AMAZING, what I have always strived towards. But I couldn’t – even with doctoring the recipe – get away from the canned bean taste. For those of you who have the time and dedication, I point you to Ottolenghi’s hummus recipe – chickpeas from scratch with baking soda. Happy cooking – and soooo many thanks to this site for all their fab recipes. Hi Dana! I just wanted to tell you that I’ve tried hummus many times and unfortunately never ended up with something that could satisfy me. With this hummus however, wow! It’s literally perfect! I heated the chickpeas on the stovetop AND picked the little shells off of them! the result is the creamiest hummus I’ve ever eaten and garlicky to perfection! thank you! OMG soooo good and so quick. Why would you ever buy hummus again? This really is the best hummus ever. I used dried beans, because canned beans take up too much pantry space. I just boiled the soaked beans with four piece of garlic peeled and sliced to give that garlic flavor. This is a trick I learned from The Plant Power Way. Additionally, I added one piece raw garlic with the middle removed (a trick a learned from the Gazpacho recipe posted on Jamie Oliver’s FoodTube). This takes out some of the kick and mellow the garlic out a bit. Since I didn’t keep my cooking water I had to use a lot of water to thin this out. I just added 1/4 cup at a time to get a good consistency. I love your recipes generally, so I decided to give this a go despite having made home made houmous many times before with underwhelming results! I cooked the chickpeas and garlic on the stove instead of in the microwave and it turned out really, really well – by far the best houmous I’ve made and definitely up there with store bought types! It has a deep, rich flavour. The only thing I’d do differently next time is maybe add more olive oil as we like slightly oilier, less solid houmous in our household. Thanks so much for sharing this recipe! I love hummus. I never ever thought I could make it but I jumped in and tried the recipe without any changes except decrease salt. I have to watch salt intake. Anyway this came out excellent. And what’s nice was I got to control the salt. This is definitely a keeper. We absolutely loved this recipe and made it with some homemade Thyme crackers! My 21 year old son has bc a diehard vegan. I am basically a vegetarian mainly bc I don’t like meat. He has asked me to help him. Wow! It’s a transition for sure! I’m along way from arriving but I have given up milk which I LOVE! I haven’t had 1 sip in over two weeks. Only regular almond milk. Thank you so much for your insight. I am gonna try to make the hummus tonight w the Mediterranean sweet potato dish (my 1st vegan meal). I’m excited and a bit nervous. But it looks “user friendly” for a newbie in the vegan department. Thank you so much. And looking forward to more ideas from you!! I don’t have a microwave and have no plans to get one. Warm the chickpeas and garlic in the oven? Of course. See, I’m not a cook! I really loved the texture, the microwave makes a huge difference! Thank you Dana, the best hummus recipe I’ve tried so far! Hmm, I’m not sure! If you’re concerned, reduce the amount of time in the microwave! I liked the result of the chickpeas at 600w for 3 minutes and then dialled down at 180w for two minutes, but I could have kept them warmer without a problem! Will probably do 600 for 3 and then 360 for 2 next time and see if it is better or same. :) They weren’t mushy or burnt, just warm (ok, hot) and soft and wonderfully easy to mix into hummus, and the garlic was soft and fragrant. Maybe that helps a little? This recipe is so great! I just tried it and I loved it, it was so simple and easy. This hummus is so easy and delicious! Who knew there were so many Hummus devotees.. My 1st taste. Its very good. Cooling in my fridge right now. Mine is also a bit runny, hope it thickens a bit as it cools. LOVE this hummus!! I’ve been searching for an easy but delicious everyday hummus. This is so simple to make and absolutely lives up to the hype from your post. I follow lots of recipe blogs and yours is by far the best! I have made lots of your recipes and they have all been successful and true to the description – keep up the great work. Thank you! So kind! Glad you liked it! This is a super good base for a recipe- I’ve got a tried-and-true hummus recipe that tastes nothing like the creamy store-bought, but this one with a few modifications is definitely replacing that one because it’s so darn creamy! First, I already put in only about 3/8 cup of tahini, but I’m gonna bump it down even further to 1/4 because my tahini has such a strong flavor. And second, it’s a little too runny for my taste, so I’ll get rid of a few tablespoons of the liquid from the can of beans next time! Last, MORE GARLIC. Vampires probably hate me. And anyone who smells my breath. I haven’t had store-bought hummus in a while, so I’m not sure how this compares to it, but it’ll be much more suited to my taste with those few little changes, even though it’s already great now! this stuff is BOMB. I could seriously eat it with every meal. the microwaving seriously makes the biggest difference. it is so garlicky and delicious ? thanks so much for sharing!! My husband just got back from Israel a week ago and was craving homemade hummus. I told him I had this recipe we could try and he loved it! It was delish and will definitely be a new regular edition to our household meal plan! Thanks so much for sharing! I never peel the chickpeas… if you blend the chickpeas in a vitamizer, (you know the ones that grind ultra fine), then it’s soo smooth and creamy, you would not know the difference. And then you don’t lose all that valuable fibre from the skins. I microwaved the garlic separately in a little water…. and then poured the lemon juice on top while the garlic slices were still warm, letting it sit till cool. Then I stuck it in the blender with the chickpeas… magic flavour from the garlic/lemon soak. I always sprinkle on zataar and sumac then drizzle on olive oil… how does everyone serve theirs? This recipe is flawless – I just made it and it turned out wonderfully. Couldn’t wait for it to cool to sample it, it’s already delicious, now it in the fridge and I’m waiting impatiently for more…. THANK YOU Dana! OMG! I just made this and Wow! Couldn’t be easier and couldn’t taste better. I will NOT be buying any store bought hummus again! Awesome, easy, fast!!! I added in more lemon juice, and sriracha 1 tsb, and 1 tsb of cumin. P. S. After going to several stores to find tahini (and passing by unknown hundreds of containers of Sabra Hummus, I finally got it from Trader Joe’s. But wait – there’s more! Just found that (At least in my area) that Amazon fresh sells a 15 ounce can of Joyva tahini for about $6. The tahini that was so hard to find, now they drop it off at my doorstep! Great recipe. I’ve made it several times and found that if you use all the water in the chickpeas it turns out a bit runny. Drain off about 25% of the water for a thicker mix. Thanks for sharing your tips! Glad you enjoyed it. Oh lord oh lord oh lord! I just made this and it’s truly amazing! So creamy and dense (and easy! ), exactly what you should expect from a perfect hummus. I just took some liberty and added 1tbs of ground cumin (that’s it, I swear). It’s my first Minimalist Baker recipe and it’s definitely a winner. I’m never buying supermarket hummus again, for sure. Thank you so much for sharing guys. Your blog is awesome, love the concept (who wouldn’t? ), I can’t wait to try some more of your recipes. The vegan cheesecake is next on my list! So great! thanks for sharing, Aimee! Oh my goodness you are amazing this is life changing! I’ve made so many different hummus recipes (even the ones that call for peeling every darn chickpea) and this is BY FAR the best. Because I love garlic and lemon, I added 5 garlic cloves (I would add even more next time hehe) and 2.5 tbsp lemon juice! Perfecto! I was licking the spatula! And I hate pulling out my heavy equipment, so I tried my hand held immersion blender. Worked like a charm! Thanks for the amazing recipe!!!! Oooohhhh YUM! Spot on Dana – thank you for this recipe. Just made it and the kids and I devoured half its so delicious! Another minimalist baker recipe I’ve tried and kids have loved! Thank you! Yay! Thanks for sharing, Jane! This hummus was awesome! 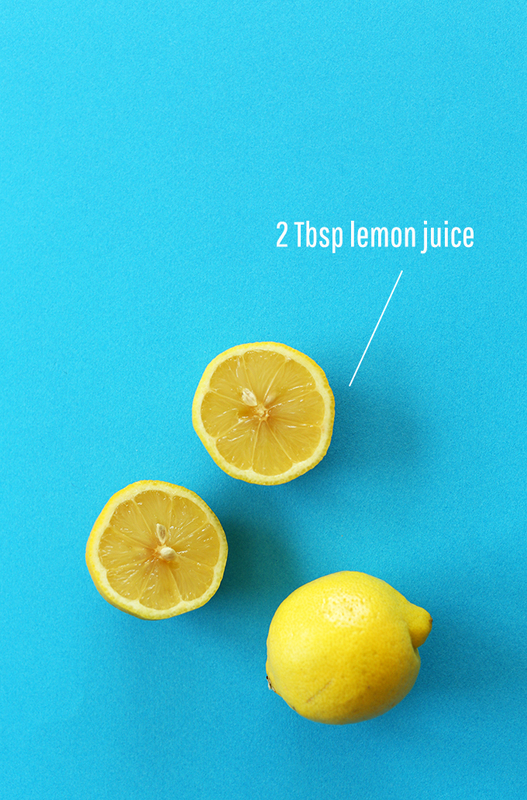 I used about 1 and 1/3 lemons, however. I also like to put a little bit (1/2 tsp depending on your liking) of cumin. It seems to bring out the flavor more. Microwaving it made such a difference on the texture, delicious! OMG the best hummus ever!!! I never seemed to get hummus right and although I try to avoid the microwave as much as possible, it does seem to make it more creamy. I guess it would work if you would simmer it in a pan as well. I don’t know about the lemon, without it, will it be good? Can’t wait to make this omg!! I’ve been looking at all your vegan recipes and drooling. Do you know how long this will last if I keep it in the fridge?? Several days – even 4-5! Loved your recipe, I made it 5 times already and each time I get so many compliments :D Just a small tip that we use back in Jordan, I added 2 tablespoons (or 3 tablespoons depending on your taste) of greek yoghurt to the mixture, and this way you get a traditional humus just as we do back home :) Thank you so much for sharing this lovely recipe, I love your blog! When I first saw this recipe I was not interested, but found myself in NEED of some hummus this past weekend and no car available to get to a market… so I tried it. Seriously? The. Best. Homemade. Hummus. Ever. I made it exactly as the recipe and it was wonderful! Even my husband tried and said it was better than store-bought stuff. Next time I’m going to try roasting the garlic first, should be good! Whoop! Thanks for sharing, Allison! OK I just made this…please tell me it thickens up when cooled. Yep! Quite a bit. Otherwise, add more tahini or chickpeas. 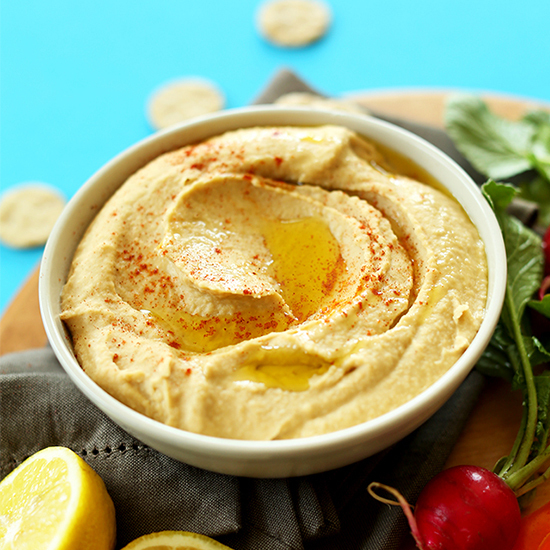 I have tried so many “plain” hummus recipes, and this is the best by far! I was a bit skeptical about the amount of tahini, but it was perfect! I used lemon juice that wasn’t fresh, and it still worked magnificently. Thanks Minimalist Baker! Just finished up making this and oh my god, so dang tasty! So so so creamy and I love that you can change it up by adding more garlic, chilli etc. Thank you for the brilliant recipe, goodbye store bought hommus! Yay! So glad you liked it, Katherine! Just made this recipe, and I’m really liking the flavors! I skipped out on the olive oil because I prefer an oil-free hummus and it seems a little too thick/rich. Any suggestions for a good oil replacer? Maybe thin it out with water or a little veggie broth? Great recipe. Thick and creamy. Can’t wait for it to cool down so I can eat it with some veges. Gonna take it to a party next weekend. Oh my gosh! This is THE best hummus I have ever made–it totally tastes like it’s from a restaurant…and this is why I always come to your site for any recipe now. Thanks, MB!! I was dubious, but followed your recipe and I couldn’t believe how good it was! It’ll be on high rotation at my house! I am having trouble printing a recipe off your website. I press the print and it only prints the picture of the recipe. Can you tell me what I am possibly not doing correctly? Just whipped up a batch of this and it is amazing!!! 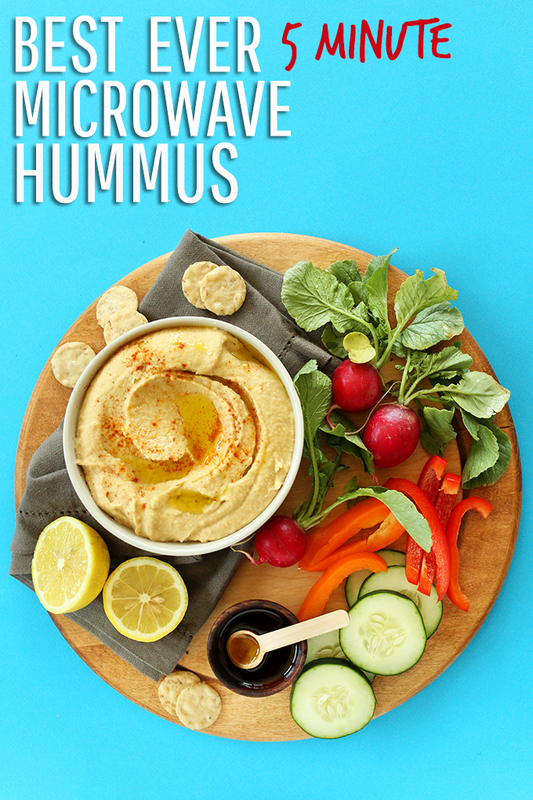 I love hummus but always prefer the “real” stuff from a Lebanese restaurant nearby, to store bought, and this recipe tastes like restaurant hummus! Absolutely love it! Will definitely be keeping this on hand. Thanks! This was SO delicious. If I made it again the only change I would make would be to drain half of the liquid after microwaving, reserve it, and then slowly add it to the blender to get the desired consistency. I found it to be a bit runnier than I usually like. I never serve it warm though, and it made all the difference! Thanks! So glad you enjoyed it, Brittany! Thanks for sharing. I agree that you have to be careful with how much liquid you have. Based off the pictures, my can of chickpeas came with a lot more liquid (there was a good half-inch of liquid above the chickpeas in the bowl), so some of it should be discarded. Thia recipe is fantastic! I would never have thought to microwave it but it makes for a perfect temperature and is so hearty. Thanks for a great recipe! Yay! Glad you liked it, Betsy! Made this, loved it!!! I added some Zaatar and a little bit of black pepper, some really nice olive oil to serve, and it was a big hit with everyone here! I made this today and you are right: the difference in flavour after 5 minutes in the microwave is amazing. I added some caramelized onion chutney to mine. Delicious! Thank you for your fabulous recipes. Tonight I am going to churn my Snickers ice cream, which is waiting patiently in the fridge! I made this today using less tahini and oil and it still came out amazing. I’ve never found a hummus recipe to make at home that was delicious enough to warrant the effort, until now! Thank you! Hi Dana! Love your blog! Just made this hummus, and it is DIVINE – especially with warmed pita and kalamata olives. Question: have you tried re-microwaving it again after being refrigerated, and is it just as good? I just made this and worked out like a dream. So delicious and so easy. LOVE. Hi Dana! I have raw unsalted tahini. Do you think this would be tastier with roasted salted? What did you use? Thanks! Now I plan all my weekly meals around your recipes, BTW. My neglected library of vegan cookbooks is not very happy with me as of late… :x ! Super skeptical because of the “nondraining” and micro.. but this hummus is super good!! I too love cumin and did end up adding some to the mixture. It is definitely better if it sits in the refrigerator a few hours afterwards to thicken up a bit. This is my new go-to hummus recipe!! I was skeptical at first because of the microwave step and the lack of cumin (the man and I love cumin a little too much). So easy, so creamy, so delicious. I am guilty of licking the bowl clean and not offering to share. I am looking forward to trying this! I always make terrible hummus and can’t figure out why. I never comment on blogs….. and I have been making hummus for 25 years. This is, without a doubt, the BEST recipe I have used. Made it this afternoon and already the tasters are wanting more. Well done m.baker! wow! Great compliment! Thanks for sharing Allison! so glad you enjoyed it! It’s actually been passed around all of the family who are now converted to the microwave recipe. I’m working my way through your wonderful recipes! OHMYWORD!!!! You did it! This is THE hummus recipe I have been looking for for years! No more expensive stuff from the store! By the way, I cooked up a bunch of chickpeas in my pressure cooker along with cloves of garlic then I just measured out 1 1/2 cups of the chickpeas and put in the cooking water to just cover them (just like if you opened a can). Since everything had just been cooked together I didn’t microwave. Worked and man is it creamy. THANK YOU!!! I’m not such a tahini fan, so I tried Cashew instead. It turned out very creamy and delish!! Although it was a bit too much fresh garlic for me. OMG! This is such a fantastic idea! Do you think you could strain the beans and put water in the can with them instead of the “bean juice”. The juice sort of scares me lol. I am one of those people who has been peeling their chickpeas lately to make it really creamy and smooth but I think this might be the answer! I just got done making this and I can’t believe how creamy and smooth it is! I have it in the fridge and will be taking to a party tomorrow night. I made a few changes though. I am trying to avoid oil so I didn’t add any and it didn’t need any and I add a half a tsp of cumin. I use the 4 cloves of garlic because I love garlic! I will let you know how it tastes tomorrow! this was so much easier than peeling them! Yay! Glad you’ve enjoyed it so far. Let me know how you like it after chilling!! the hummus is 24 hours old and it rocks! I am going to be using this recipe from now on. Thank you for sharing. I was taking about 15 mins to peel the chickpeas beforehand. I love this idea! I personally simmer mine for a couple of minutes and then remove the skins for an extra creamy hummus, but I may have to try microwaving instead of over the stove next time. Thanks for this! Yay! Glad you enjoyed it, Wendy! I’ll have to give this a try. I usually don’t like recipes that call for microwaving (I’m one of those ppl who think they are evil!) but I’ll give it a shot just for you, Dana! You’ve sold me! I don’t use the microwave often or ever really! But for this it was worth a try. If you don’t have one or you’d rather not use one, you could easily heat the chickpeas and garlic together on the stovetop. Hope that helps! Never ever would have come up with this, but now I definitely have to give it a shot!! Thanks for the heads up! Oh my God, this is so exciting! I have a humous *addiction* and I find the supermarket varieties are never as good as the ones served in a restaurant. I cannot wait to try this recipe! Extra garlic flavour sounds fantastic. Looks delicious!!! I love things that can be done so quickly! I’ve never thought of microwaving the chickpeas and garlic. I make hummus almost weekly and I’ve added roasted garlic before and that was awesome, but… well, I’m not going to knock it til I try it! Thanks for sharing the secret with us! Mama has been hummus-ing up the kitchen biweekly lately. Perhaps I will challenge her to a hummus-off with this astonishing recipe. Ok, this is weird. Yesterday I got an e-mail from a friend telling me about a tip she’d learned from Cooks Illustrated. The tip was to blend up chickpeas when they were warm for ultra-smooth hummus. So I thought, hmmm…not a bad tip for my peanut butter cup filling. And then, after I read that e-mail, I saw this post. CRAZY, right? Thank you both very interesting information ! I have only fairly recently got into hummus and wanted to make my own so I brought the book Hummus Bros, Levantine Kitchen. I have just had a look and they use a similar way with dried chickpeas I thought you might be interested. They say” dried chickpeas have a nuttier flavour, and they give the hummus a grainier texture. Many brands of chickpeas are crunchy and undercooked, however you can now buy jars of excellent ready-cooked chickpeas,preserved in water and salt, without added artificial preservatives. 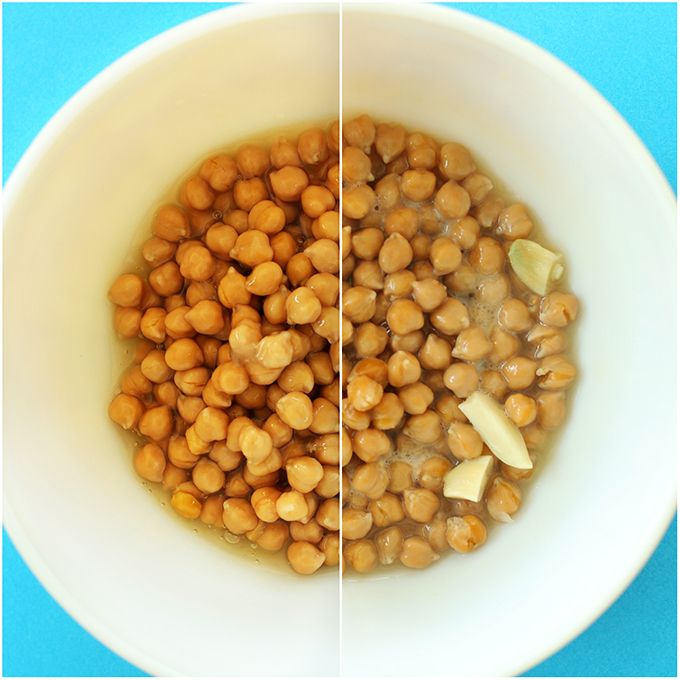 We cook our chickpeas with bicarbonate of soda to make sure that they are soft enough to make creamy hummus. This prevents the calcium in our London tap water from cementing togeather the pectin molecules in the peas cell walls- in fact, the alkaline water that it produces actively encourages these pectins to separate, creating a softening effect. We use 10g/1/4oz bicarbonate of soda per 500g/1lb 2oz dried chickpeas. After a 12 hour soaking period, the chickpeas take a quarter of the tie to cook-and achive that loverly fluffy texture which makes such great hummus. I hope this helps in your creations. But sadly does not answer my question. I have never had a microwave, what is the equivalent of stove top cooking ? Do I bring the chickpeas to the boil ? Simmer for a few mins ? Just bring them to a simmer for 4-5 minutes on the stove! Do you then drain them before placing in food processor? Or add them with the remaining liquid? Add them with the remaining liquid! #ScienceYo haha, thanks for the info! Love the quick idea recipe! Tahini is good on so many things – on toast with jam is one of my favorites!! 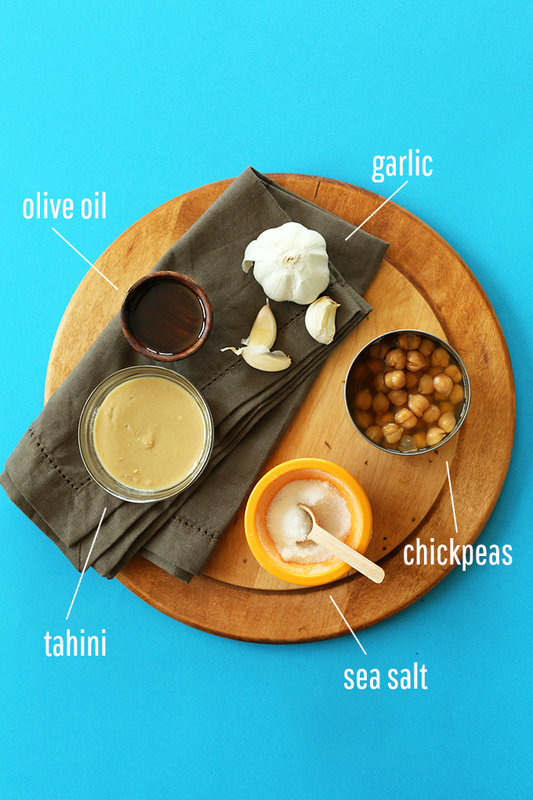 I have always used Tahini in my hummus – glad you like it too! I have to try this! The microwave concept makes so much sense, but seems strange at first. I thought I had found the ultimate hummus recipe, this one seems to be more promising than the recipe I found! Give it a go! I feel like hummus is such a personal thing. Every body has their own favorite version. This is mine! Love all your recipes and thanks for this hummus one. The real secret to extra smooth and creamy hummus is peeling the garbonzos/chickspeas. I kid you not. Its a bear to do but boy is it worth it! I do everything you say in your recipe except cooking the garlic in the olive oil on a stove top and occasionally add a few flakes of red pepper for even more zing. I’ll try the microwave — after peeling! Great tip! I saw that somewhere before but I fear it’s not in the cards for me. So impatient! Easy to peel chickpeas! For this you will want to reserve your liquid and then put the beans in a medium mixing bowl. Fill with water and use your hands to move the beans around…all of the peels will float to the top. Awesome. I’m totally intrigued by this concept! Definitely going to bust out the blender and a can of chickpeas for this one when I get back to KC. Who knew microwaving would make such a big difference? I’ve never really been ‘wowed’ by homemade hummus, but I’m positive this is the trick to do it! I am super intrigued by this technique! I stopped making my own hummus a few years ago because I couldn’t get that silky texture of the store-bought variety. Just double checking – you don’t drain any of the liquid from the can, even after microwaving? You have to be careful with how much liquid you have. Based off the pictures, my can of chickpeas came with a lot more liquid (there was a good half-inch of liquid above the chickpeas in the bowl), so some of it should be discarded (looking at the pictures in the recipe, the chickpeas in the microwave bowl are breaking the surface of the liquid). Agreed. I just had the same problem and now I have some watery hummus, I will add more chickpeas, but the can juice was also way too salty for me. I used a store brand, organic with sea salt for low sodium. I’m sure next time when I add the water slowly while blending that will fix the problem. Cheers! sometimes 2 cans of chickpeas with 1 can chickpea liquid does the trick. This looks so smooth and perfect! I’m a total hummus addict so hope to try this out soon! I’ve kind of sworn off homemade hummus because it really never is as good as the store-bought kind… but this may be just the ticket! I can’t wait to try it! Knowing that microwaves change the molecular structure of foods, I’ll have to perhaps heat the chickpeas with garlic on the stove, which I wouldn’t mind. But, I do have to admit, this recipe does look good. Thank you. COOKING changes the molecular structure of food. Love this hummus recipe. It’s a staple! SO MUCH EASIER and I honestly think it’s tastier than the other versions of hummus I have tried at home. Stroke of genius! Sorry, but this is not true. Microwaving can preserve more nutrients in certain foods. It’s a case by case basis. Radiant heat in ovens, on the stove, etc. has the same “radiation”… microwaves do not use ionizing radiation, if that is the concern. The importance of shielding is so you don’t cook yourself, microwaves penetrate about an inch into their target without shielding. Marisol, that is not true. Nancy, you are correct. Yes! Exactly what I was thinking! I don’t even own a microwave because of that. I’ll use my pressure cooker instead ? Exactly. Microwaves are the least likely to change the nature of food than any other cooking style. BBQs are the most likely. It’s ionizing radiation that changes the nature of something. Microwaves are non ionizing. You need to go back to your high school chemistry notes to see what that means if you don’t know. Microwaves work by heating up magnetic/electric ions. When heat is applied the magnetic atoms spin one way and the electric atoms spin another. The friction between them causes heat. Not ionizing radiation. Also: it’s tedious but if you skin the chickpeas- squeeze them lightly not to smush them but to release them from their skin-and then make the hummus from skinned chickpeas, your final result is super creamy and smooth. Did you try cooking on the stove as opposed to the microwave? I don’t own a microwave either (not a fan of it) so I was thinking of cooking the chickpeas as well over the stove. Hi! Just bring them to a simmer for 4-5 minutes on the stove! That’s why I’m using the stovetop for mine! Ooh, I love hummus! My favorite hummus is from a Italian/Mediterranean restaurant. I’ll be interested to see if this is better. ;) Is the tahini strong with 1/2 cup? No. Not really. I added extra garlic and yum! It’s pretty soupy after making it so it must be refrigerated to set. It’s quick, easy, and delish. You rock. This recipe rocks. Hummus is my life. I am going out to buy tahini just for you. I am also saving this recipe forever because to be honest, I have not been a fan of most homemade hummus recipes. This looks awesome, Dana! Hey! Sometimes I’ll attempt to make my own version at home using sesame seeds, but I’ve been making variations of this recipe: http://allrecipes.com/recipe/extra-easy-hummus/. It’s not bad–but not quite the same! Usually I’m not a lover of a full-of-tahini hummus, but this step in the microwave is surely to try!!! I definitely gotta try this!! Intrigued. That’s crazy! I wouldn’t of thought that microwaving the mix would have such an impact. Can’t wait to give this one a go! great idea. I was loving Hummus so much! I cannot eat it anymore /Paleo/. But this is really save timer..
you should try the paleo version of this with nut/seed or avocado base. Love hummus! i’m an addict. haha. Dana, i recognize that photo from “school.” YAY! If your diet removes legumes, nuts, or seeds then you should certainly rethink that diet. You can use any of the below sources showing increased lifespan with legume consumption. All ‘Blue Zones’ have high carbohydrate/legume consumption. Paleo is fringe, unfortunately. W. Chang, M. Wahlqvist, H. Chang, C. Hsu, M. Lee, W. Wang, C. Hsiung. A bean-free diet increases the risk of all-cause mortality among Taiwanese women: The role of the metabolic syndrome. Public Health Nutr 2012 15(4):663 – 672. S. J. Nechuta, B. J. Caan, W. Y. Chen, W. Lu, Z. Chen, M. L. Kwan, S. W. Flatt, Y. Zheng, W. Zheng, J. P. Pierce, X. O. Shu. Soy food intake after diagnosis of breast cancer and survival: An in-depth analysis of combined evidence from cohort studies of US and Chinese women. Am. J. Clin. Nutr. 2012 96(1):123 – 132. S. M. Krebs-Smith, P. M. Guenther, A. F. Subar, S. I. Kirkpatrick, K. W. Dodd. Americans do not meet federal dietary recommendations. J. Nutr. 2010 140(10):1832 – 1838. S. E. Fleming, A. U. O’Donnell, J. A. Perman. Influence of frequent and long-term bean consumption on colonic function and fermentation. Am. J. Clin. Nutr. 1985 41(5):909 – 918. M. Zanovec, C. O’Neil, T. Nicklas. Comparison of Nutrient Density and Nutrient-to-Cost between Cooked and Canned Beans. Food and Nutrition Sciences 2011 2(NA):66-73. Y. Zhang, H. Kang, B. Li, R. Zhang. Positive effects of soy isoflavone food on survival of breast cancer patients in China. Asian Pac. J. Cancer Prev. 2012 13(2):479 – 482. H. M. Spiro. Fat, foreboding, and flatulence. Ann. Intern. Med. 1999 130(4-Pt-1):320 – 322.